—The number of people reported to have the flu also increased yesterday by 59 to 1,473, including a 14-year-old schoolgirl in Ubon Ratchathani who attended a Korean boy-band concert in Bangkok last weekend. Five schools have closed, including Benjama Maharat in the northeastern province where the girl studies. In Ubon Ratchathani, Wutthikrai Mungmai, a provincial health official, said the results of a lab test confirmed the girl who was at the boy-band concert had contracted the flu. The girl came down with a fever on Monday and when her condition worsened a day later she sought treatment at Ubonrak Thonburi Hospital, the official said. 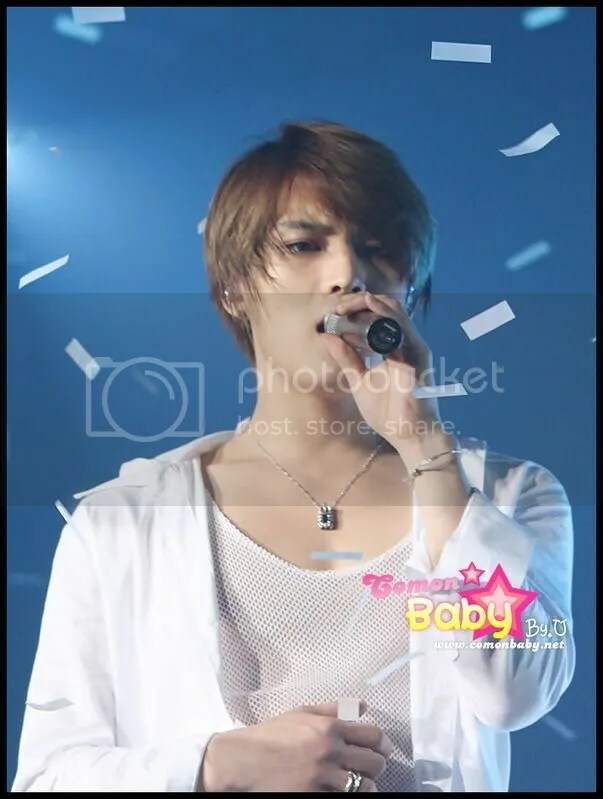 The girl, he said, went to a weekend concert by the Korean boyband Dong Bang Shin Ki, at Impact Arena Muang Thong Thani. The band held two concerts, on Saturday and Sunday. It was unclear which concert she attended. Mr Wutthikrai said three more students from the same school are thought to have the flu. Lab test results are due tomorrow. After the infection was confirmed, Benjama Maharat School announced it would close until next Thursday. Four more schools across the country have also decided to suspend classes, to allow students with flu to recover over the long weekend. They were Ang Thong Patthamaroj Witthayakhom in Ang Thong, Udon Pittayanukul in Udon Thani, Wiset Suksa in Prachuap Khiri Khan and Ban Bang Kapi in Bangkok. Ang Thong Patthamaroj Witthayakhom School’s principal said more than 100 students came down with fever yesterday, so the school decided to close for the sake of their safety. Newspaper section: NewsThailand has recorded its fourth and fifth fatalities from the type A (H1N1) influenza. so fans who have any of the H1N1 symptons, please do go get a check-up! and even if you are totally healthy, please eat lots of vitamins so you wont catch it! Two Flu A/H1N1-positive people have been found among us. So i think i have to inform every one just in case. _ Let wearing the muffler in order to not spread the virus to another one. (There was a case already). _ Inform your friends who had attend the concert so that we won’t let that epidemic disease spead out. _ In case you has been confirm that you’re totally healthy, don’t be careless, try to take Vitamin C as much as possible (doctor’s advices) to build up resistance to infection. Everyone please take care of yourselves! And I hope the boys are well, Tokyo Dome is coming up so soon! This is my first time writing a fan account, so excuse me if I sound too fangirly. I missed the Bangkok press conference session on 26th, though I was in central world early in the morning to collect my concert tickets. When I reached there around 9.55am, there were already cassies sitting down waiting for them, despite the press conference was programmed to start only at 5pm! I arrived at the venue around 3pm and the whole place was filled with DBSK fans, merchandises, pictures and even a Mirotic performance by a group of thai guys. 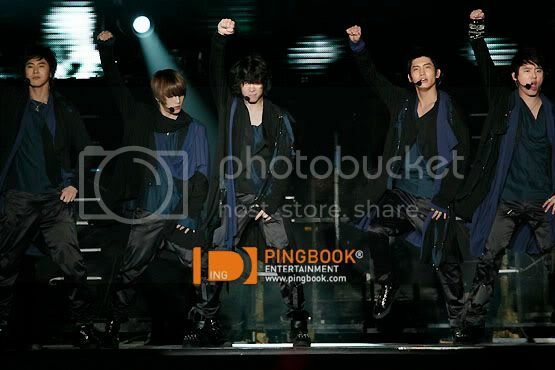 Purchased a couple of Mirotic Bangkok goods and off we go. Security was tight as no cameras or video cameras were allowed, and I only managed to enter around 5.55pm. I was surprised at how small the venue was compared to what I’ve seen in pictures! The highlight of the day for SC zone would definitely be Changmin. His voice is super good and during his solo Upon the Rock, my friend and I were like “OMG! Is that Changmin or junsu?” as we could not believe our ears. On contrary to rumors about Changmin standing out the least in concerts, this boy blew us off with his model appearance and modest attitude. 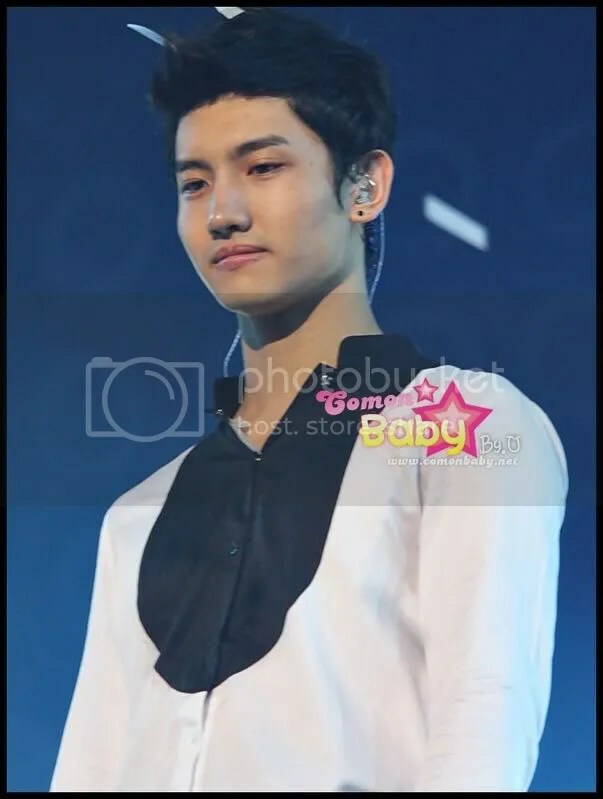 During his second solo, Changmin was standing really close to us and we were screaming “Changmin! 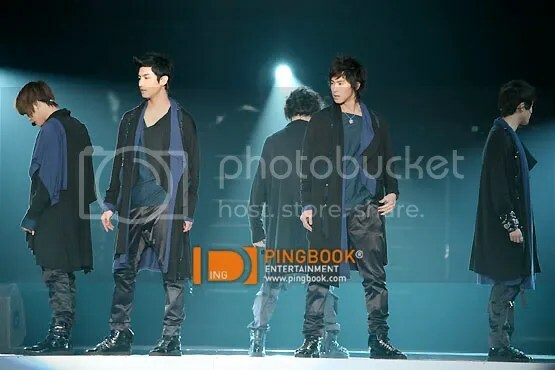 Changmin!” He looked around first, turned his head and our eyes met. He smiled and waved at us. I looked like a total maniac at that moment, screaming and waving both my hands. When the stand Changmin was on elevated, we continued to scream and Changmin looked at us again, this time face to face, smiling and waving. He’s drop dead gorgeous. 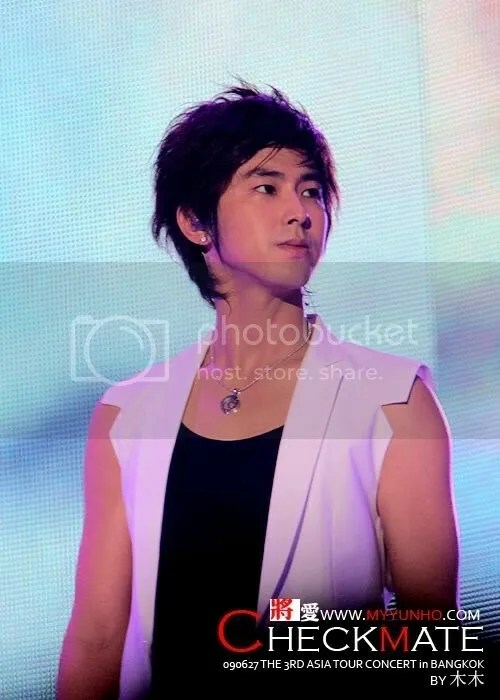 As expected from the leader, Yunho really does give fan service. He was friendly and interacted with the audiences. I was surprised at how strong his vocal was as compared on TV or videos, and needless to say, he’s better looking in real life. 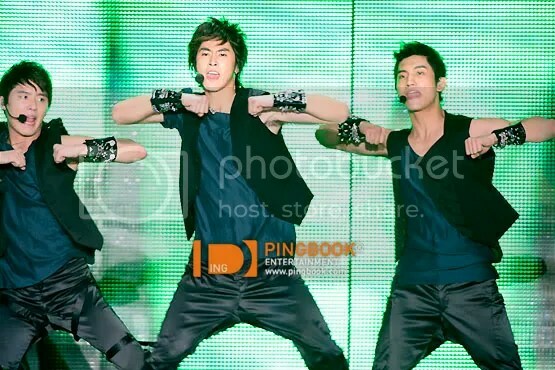 During his solo, Yunho sent out many gasps and screams by the audiences from the steamy dance he had with the dancer. However, Yunho tripped while walking up the steps for Balloons and I wondered if that was the reason why his leg was bandaged at the airport. 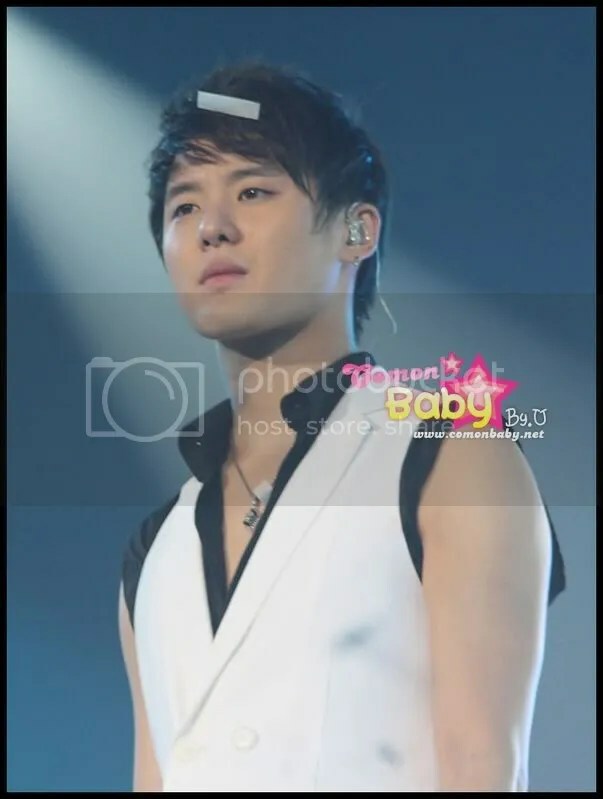 Yoochun seriously has split personality! As compared to the moody airport pictures, Yoochun brought life to the stage with his smile and we could see that he was hyper and enjoying himself. During his solo, Yoochun was interacting with the audience a lot in English, asking us what we wanted to hear, before playing Evergreen and Love Bye Love. 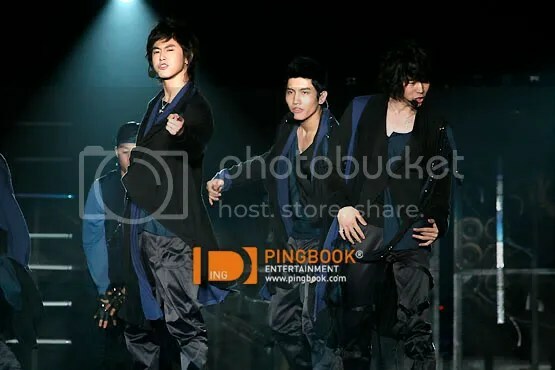 As everyone knows, Yoochun appeared instead of Key from ShineE during Xiahtic and he had a steamy dance with one of the dancers. While he was walking in between AL and BL, his shirt flapped open and we could finally see some skin~ Yoochun’s features are really sharp and he does look exactly what you see on television. 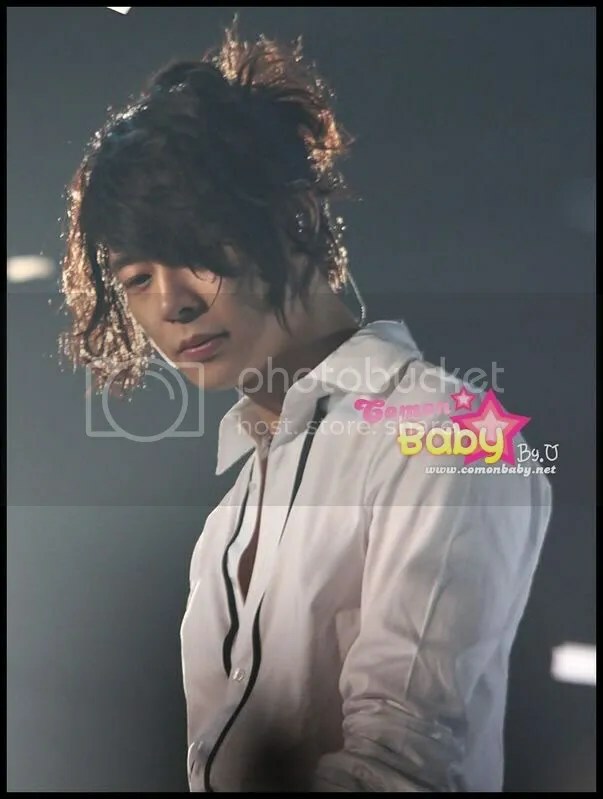 If I were rank the member most likely to get injured in DBSK, Yoochun would definitely beat others hands down. The first time was while he was walking back to the main stage, someone from AL zone threw a towel on his leg and he turned to look/glare at the person. 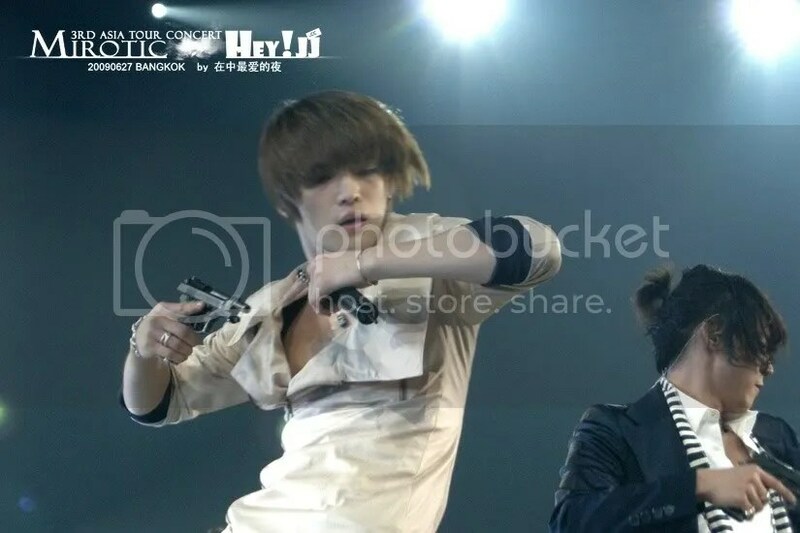 The 2nd time was before the moving stage reached the main stage, Yoochun and Xiah jumped over the big gap to get back to the main stage. 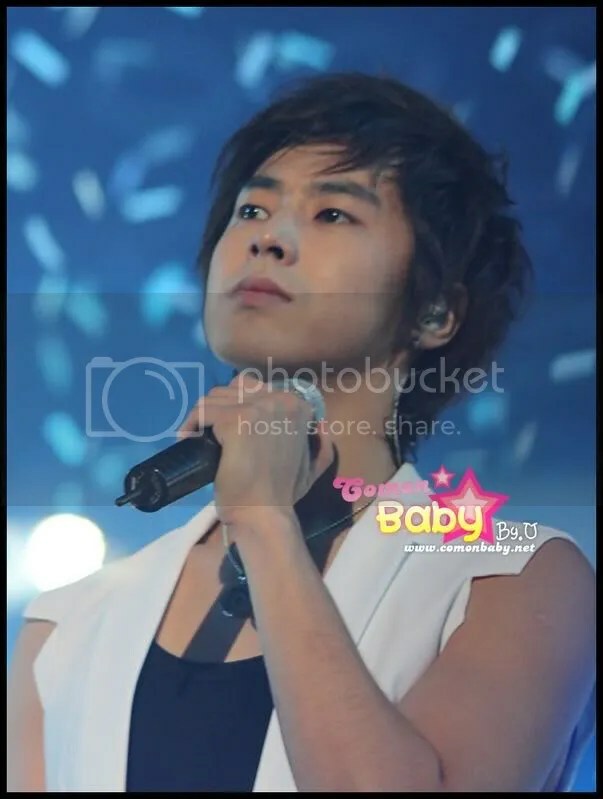 The 3rd time was when they were walking between AL and BL to thank everyone, someone from AL threw a micky mouse hand plushie and Yoochun tripped over it and held on to Yunho shoulder for support.